Figure 35.3. 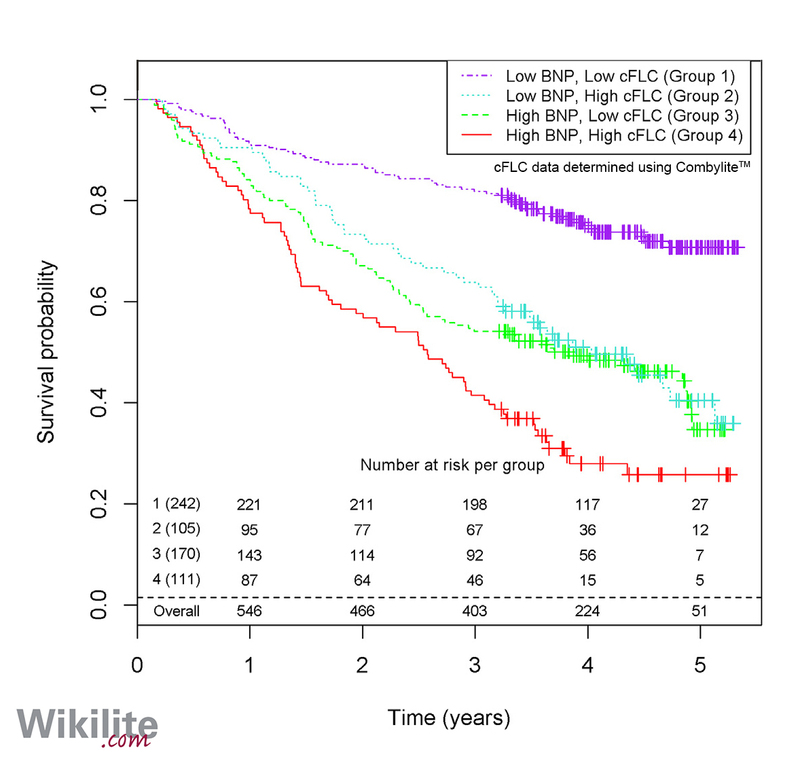 Patient survival stratified by cFLC and BNP concentrations, for 628 patients with decompensated heart failure. Low cFLC: <51.8 mg/L; high cFLC: >51.8 mg/L; low BNP: <441 pg/ml; high BNP: >441 pg/ml. (Reproduced from  with permission from Elsevier). Studies have looked exclusively at the relationship between cardiovascular disease and sFLC concentrations. Kurt et al. reported higher sFLC concentrations in patients with heart failure, and a reduction after treatment with a novel therapeutic (levosimendan), although no relationship was found with the degree of heart failure. Jackson et al. used a novel assay, Combylite®, to measure combined concentrations of κ and λ sFLCs (cFLC) in patients hospitalised with decompensated heart failure (n=628). Individuals with cFLC concentrations within the upper quartile had a higher risk of death than those with concentrations in the lowest quartile (HR 2.4; p<0.0001); this remained significant after adjusting for other established risk factors (HR 1.49; p=0.001). Moreover, the combination of cFLC with B-type natriuretic peptide (BNP), a gold standard biomarker for heart failure, stratified patients into four groups with a low to high risk of mortality. Patients with both an elevated BNP (>441 pg/ml) and cFLC (>51.8 mg/L) concentration were at the greatest risk of mortality (Figure 35.3). A similar observation was reported in patients with acute heart failure, in which cFLC were associated with risk of mortality or hospitalisation .